If you have faith the size of a Mulberry tree, you could say to this mustard seed be cast into the sea, and it would obey you? Photo: Mustard Seed. There are many varieties of Mustard and their seeds vary in size. The seed used in Jesus’ day was the black mustard. [by Dean Smith] One day, the disciples asked Jesus to “increase their faith” (Luke 17:5). They wanted to know the tantalizing secret behind Christ’s success. The disciples had followed Jesus for a several months and saw Him do an endless array of miracles and deliverances. In comparison, they looked at their own meagre exploits and concluded that Jesus was a man with great quantities of faith to perform such tremendous miracles. So how did Jesus respond to this question? The Lord told the disciples if they had faith the size of a mulberry tree, they could say to this mustard seed be cast into the sea and it would obey. No, this is not a typo. True, this is not exactly what Jesus said, but this is what the disciples expected Him to say. They were anticipating some teaching on what great things they could carry out with great quantities of faith. Instead, Jesus yanked them in exactly the opposite direction. He said that if they had faith the size of a mustard seed, they could command a mulberry tree to be uprooted and planted in the sea. A Mulberry Tree can grow from 10 to 20 metres in size (32′ to 64′). In contrast, a mustard seed was the smallest of the Israelite’s crop seeds. There are different varieties of mustard seed. The one used in Jesus’ day was the black mustard and its seed was extremely small. Looking at this microscopic seed, the disciples rightly concluded if their faith was any smaller than this, it wouldn’t exist at all. 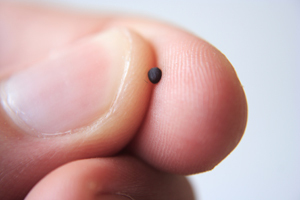 In fact, the phrase a “grain of mustard seed” was a common idiom or metaphor at that time used to describe the smallest amount — our modern equivalent of an iota — anything less and there would be nothing. This is exactly the point Jesus wanted to drive home to His disciples. The disciples had a thermostat view of faith, the more you turn up your faith, the more miracles you perform. The answer to performing more miracles was simply finding more faith. But Jesus wanted to switch them from a thermostat view of faith to a light switch mode — your faith is either on or its off. You either believe or you don’t believe. Jesus’ mustard seed analogy destroyed any sense of quantity. It wasn’t the quantity of one’s faith that was critical for miracles, but rather the quality — was it pure faith or was it polluted with unbelief.